The Wavelight Allegretto Wave® Excimer Laser System is a type of advanced eye surgery technology that emphasizes quality, safety and precision of the results we achieve for patients. The ALLEGRETTO WAVE® Excimer Laser is a “WaveFront-optimized” system. WaveFront technology not only corrects a patient’s prescription, but aims to improve the “quality” of vision during daylight and prevent problems with night vision. The system also has a unique eye-tracking system which automatically adjusts to changes in pupil size during treatment. Due to the remarkable speed of both the eye and the Allegretto Wave® procedure, the laser beam will be constantly and minutely adjusted to the position of your eye at any given time. Every four to six milliseconds, the eye’s location is measured and the internal mirrors of the laser are automatically aligned. Just before the pulse is released, a second check is made to confirm that your eye has not moved. This happens 200 times every second, once for every laser pulse released If, at any time, your eye moves too quickly to be measured or moves out of range, the laser will stop and wait for your eye to move back into position. Currently, the Allegretto Wave® is among the fastest vision correction lasers for LASIK available in the United States. For most patients, the actual laser application only takes 4-30 seconds, depending on the amount of correction necessary. Spending less time under the laser means an easier and less stressful experience during your Laser Eye Surgery procedure. ALLEGRETTO WAVE®’s laser is essentially a precise, controlled beam of energy, which translates to heat. To make sure that this beam never causes any sort of adverse heating effect on the cornea, ALLEGRETTO WAVE®’s PerfectPulse Technologyâ„¢ places the laser pulses in such a way that only every fifth pulse overlaps. Not only does this preclude unwanted heating effects, it is one of the ways that ALLEGRETTO WAVE® achieves a rounder, more natural corneal surface than many other lasers used for vision correction. 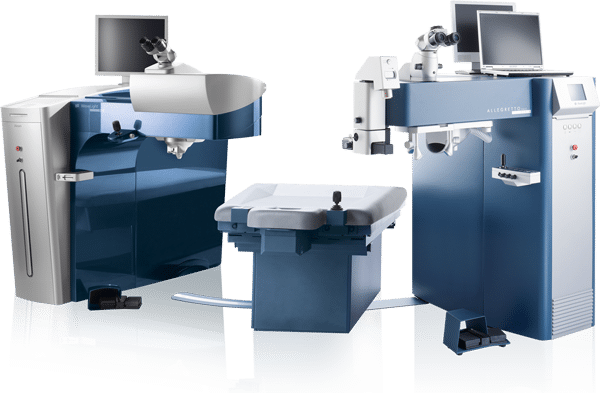 PerfectPulse Technologyâ„ represents a new approach to laser vision correction, it accounts for speed, precision, and safety in the ALLEGRETTO WAVE® laser and offers improvements that are revolutionary in the field. Smart Energy Control measures and adjusts energy levels in the laser pulse from creation to delivery. High-speed eye tracking charts the eye’s movement 200 times per second. As a result, every laser pulse is completely controlled and accurate, achieving the most accurate level of correction possible. One of the most innovative features of the ALLEGRETTO WAVE® is its use of wavefront-optimized technology to automatically compensate for the curvature of the cornea. In earlier laser correction systems, the “optical zone,” or area of correction, was centered on the front of the cornea; the result was a flattened circular area that ended with an abrupt edge, causing unwanted side effects like poor night vision, glare, and halos. ALLEGRETTO WAVE® changes all that. Understanding that the cornea is a sphere, ALLEGRETTO WAVE® uses a proprietary treatment that is adjusted to the patient’s individual corneal curvature. The ALLEGRETTO WAVE® sends extra pulses to the peripheral cornea area in order to compensate for the angle of the laser. In this manner, the spherical shape of the cornea is preserved to a degree that older lasers simply could not achieve. This compensation, combined with the incredibly small, 1mm size of the laser, produces a smooth, effective optical zone that results in what can only be described as high performance vision. At night and in dark conditions, the pupil becomes larger to permit the maximum amount of light to enter the eye. Laser eye correction needs to take this fact into account. If the optical zone is smaller than the size of the pupil at its largest, there is a good chance that the patient will experience poor night vision or problems with glare and halos around bright objects such as oncoming headlights. ALLEGRETTO WAVE® is able to produce the largest available optical zone, virtually eliminating glare and night vision problems associated with older generation lasers. The optical zone refers to the portion of the cornea that has been corrected by the laser. A larger than normal optical zone is especially important for night vision, and for patients with very large pupils. If a patient’s pupil is larger than the optical zone, they may experience poor peripheral vision, poor night vision, and a higher than normal incidence of “halos” and glare. In the past, this has been one of the biggest drawbacks to conventional laser correction surgery.